It’s Monday noon and yes, I didn’t get to a Sun(Fun)day Night post yesterday. It wasn’t much of a fun day for me, but rather an extremely full day into the night. Our midterm exams are next week and I was working all day on review guides and then on revising the two exams themselves. Yes, I felt stressed and yes, I did practice some of the mindfulness meditation techniques that I’ve blogged about here and here and here. I post this link from The Guardian as it is geared specifically to teachers. Faculty and staff at my school will recognize these simple, yet effective techniques as we’ve been using them to start faculty meetings. And we used them as recently as this morning when our deacon used the PA system to guide the entire student body through a 10 min exercise related to Advent and the Holy Family. As the stress level this time of year gets ratcheted up for you – whether you have midterms before Christmas or not – I hope this article and the exercises contained within help make your season merrier and brighter. Readers of this blog will recall that I am a passionate proponent for teaching mindfulness and meditation to students. I’ve blogged about it here a number of times. And I have many more links describing the benefits of it as well as how to teach it. Someday, I plan to post these too. 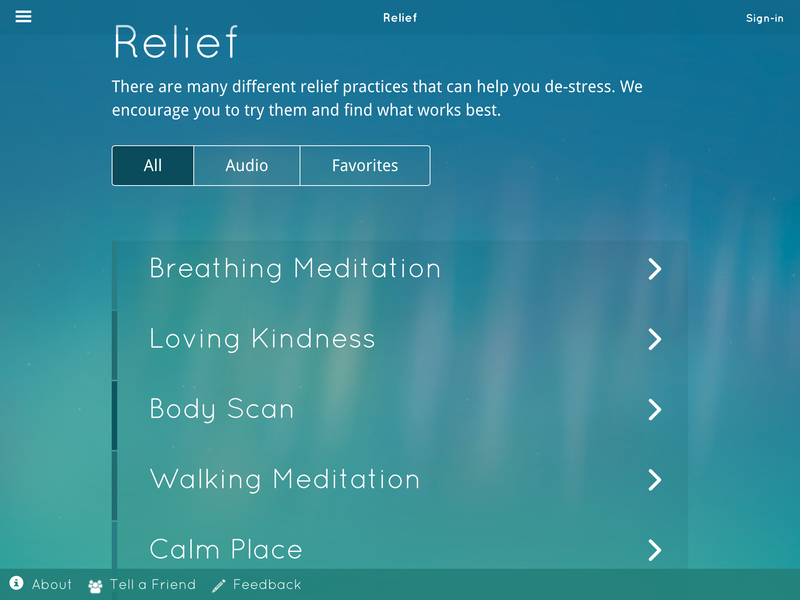 For now, I’d like to show and tell about a number of iOS apps which can be effectively used to support meditative practices in you or your students. While I provide links to more info about each (as available), you’ll need to go to the App Store to search for and download them yourself. Even though I use an Android smartphone, I have the apps featured here on my iPad only and not my phone. Therefore, I cannot speak to whether there are corresponding Android apps for any of these. 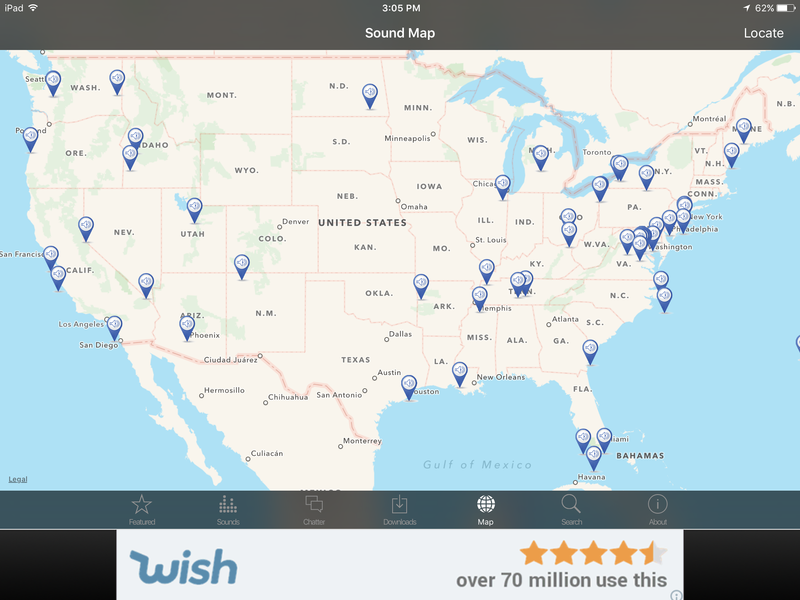 This is a pretty bare-bones app with only a handful of sounds. As it is free, clear of ads and w/o in-app purchases, it’s a good, basic, “starter app” to produce background sounds for meditation. 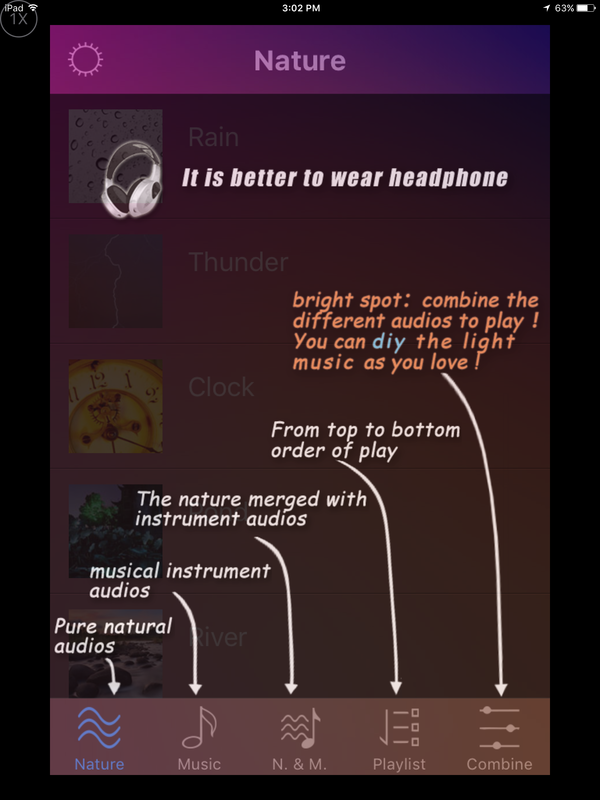 WO.Audio (Red icon version) – Free and without In-App Purchases. 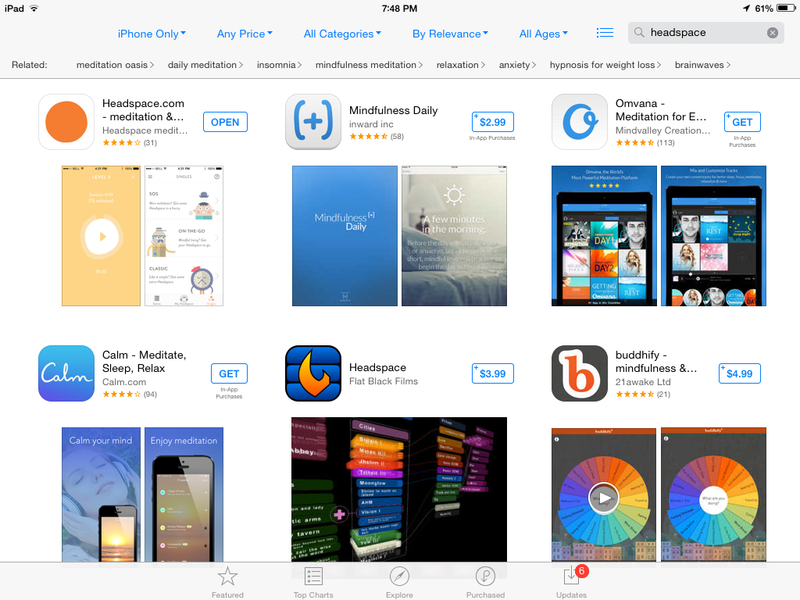 NOTE: Search iTunes App Store with the “iPhone only” option selected. For a free app, this one is surprisingly robust. 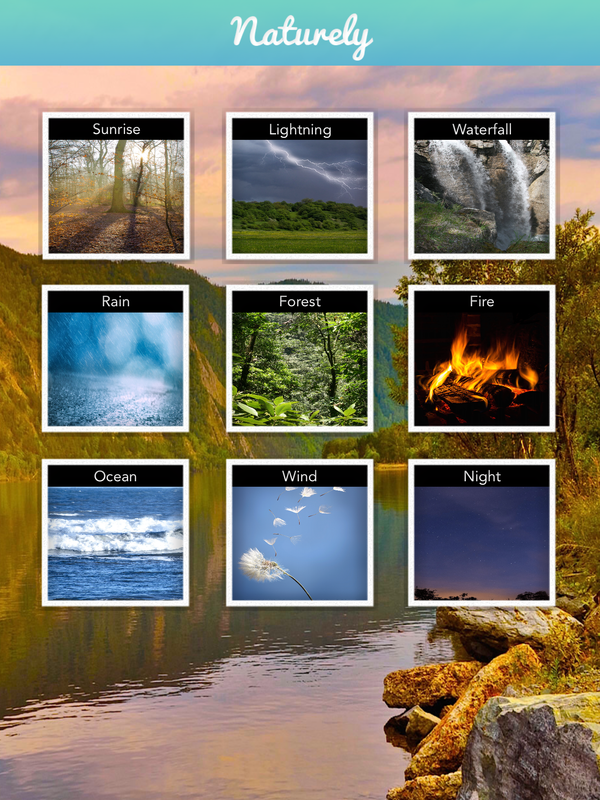 It has both sounds and music along with options for users to create their own combinations which can be saved to the app. 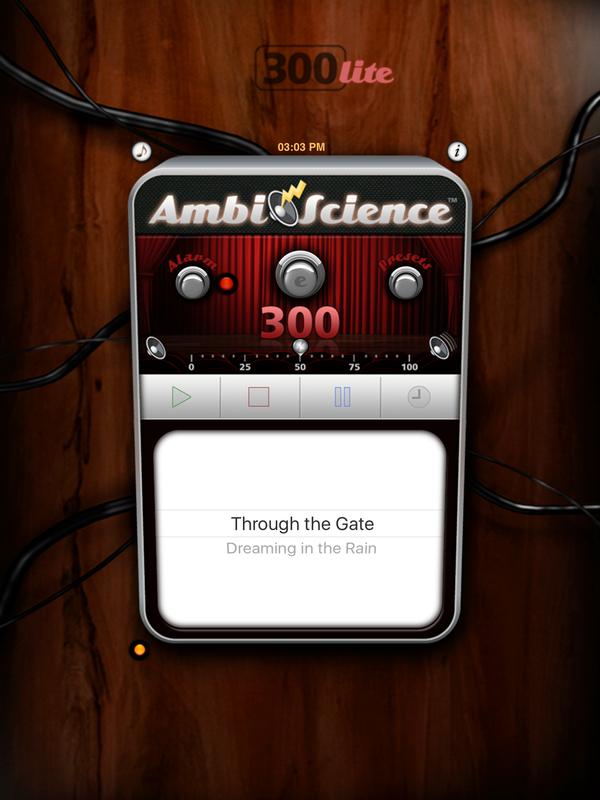 AmbiScience 300 Lite – Free and without In-App Purchases. The free version of this is pretty slim on options as it functions mostly as an enticement to download their fuller versions. Yet, this app is one of the few I’ve found which also has the option to blend binaural sound waves into the mix of music and ambient sounds. 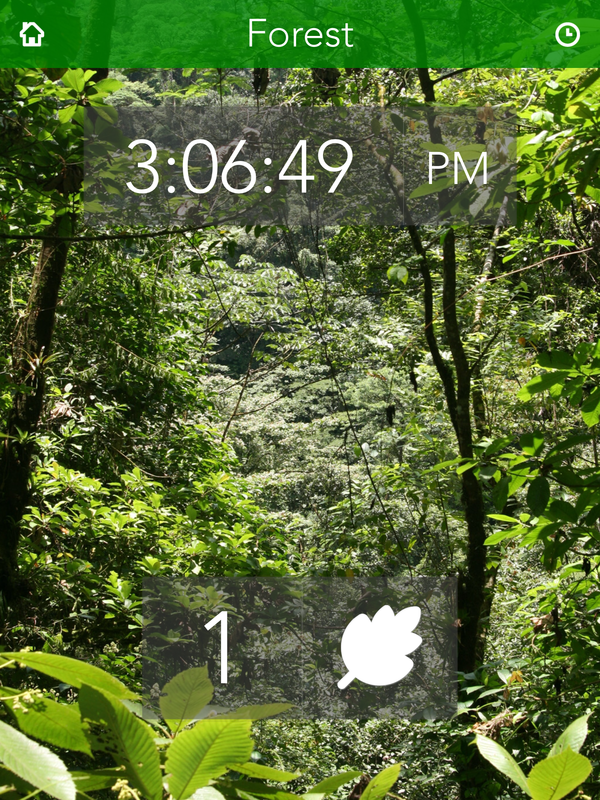 Naturely, aka Nature Clockstand – Free without In-App Purchases. 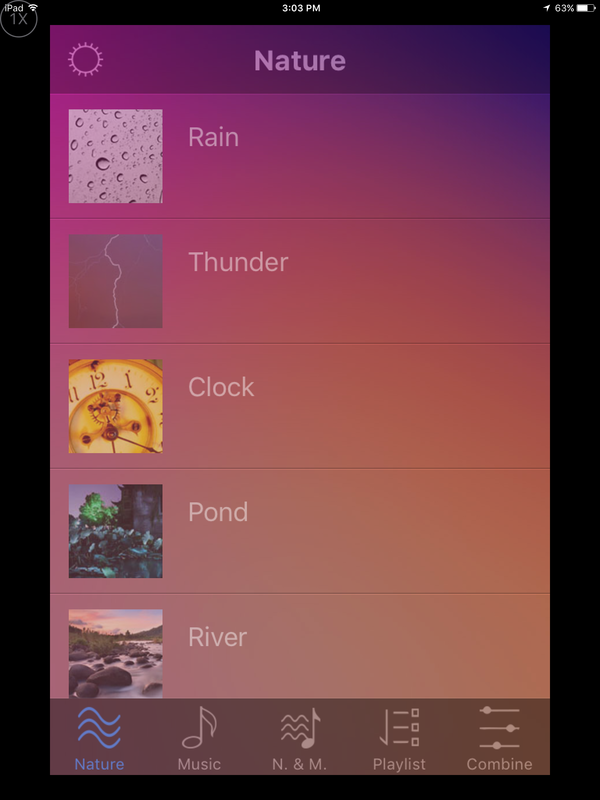 Offering a range of sounds, an attractive image representing each sound, and a built-in timer, this app is another one with a high level of usability. I like the natural images which correlate to the audio as sometimes I’ll meditate with my eyes open and gaze at art or an image. 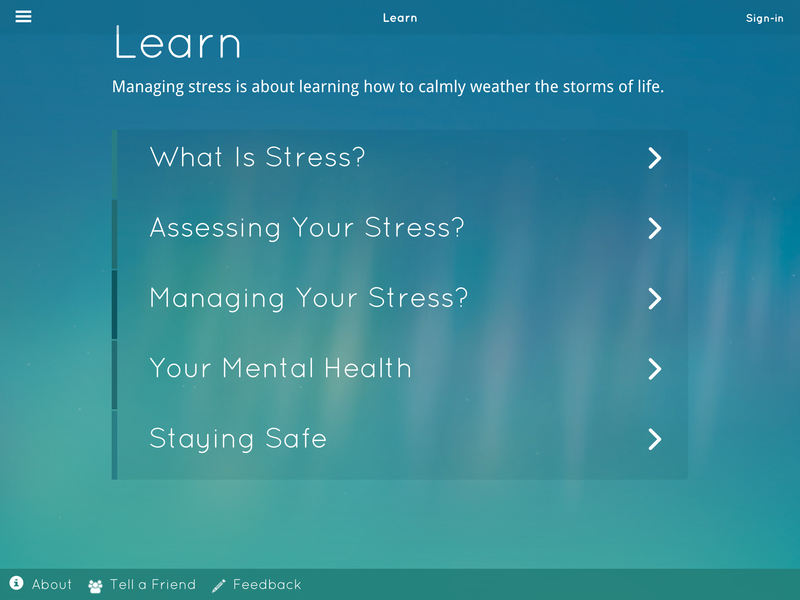 This app, while not strictly geared towards mindful meditation is designed with relaxation in mind. 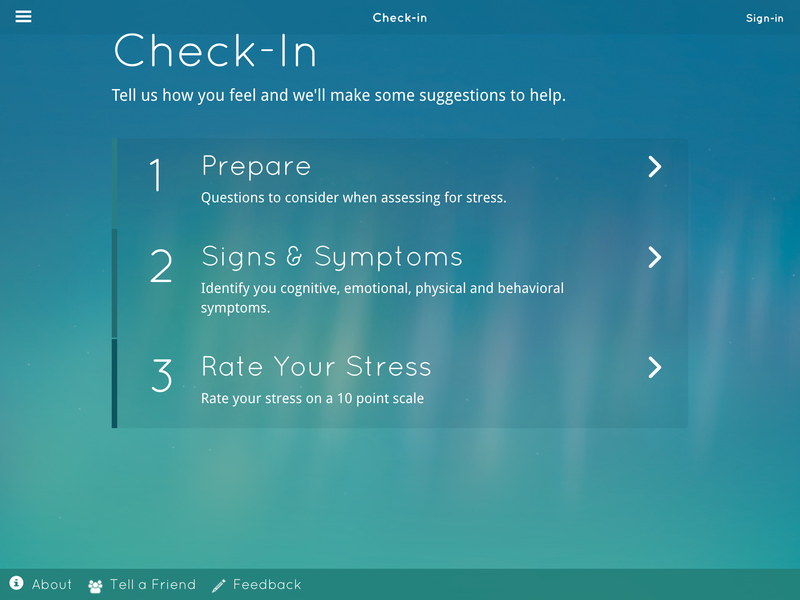 Designed with scientific research, this app is better to experience than to describe. 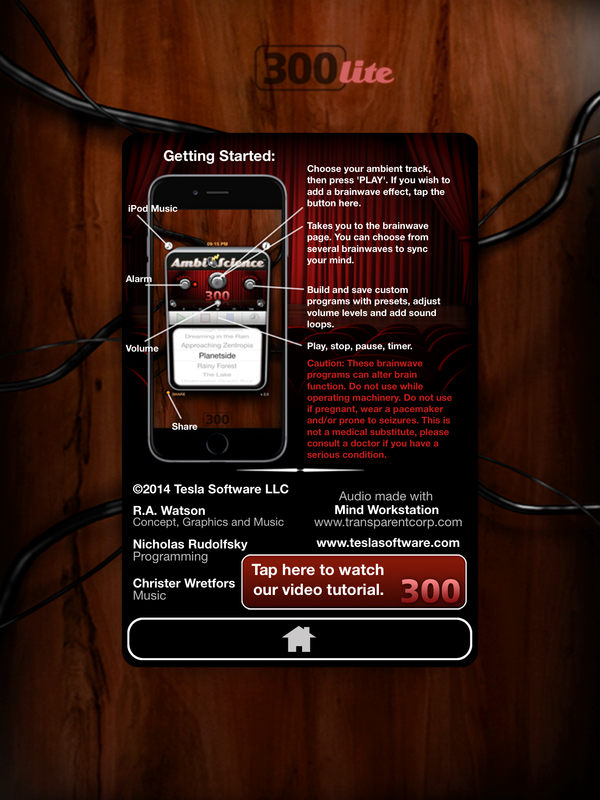 So, if the screen shots above interest you, download the free app and try it out. If breathing is important to you, I don’t think you’ll be disappointed in it. Not only does this app have the best name of the bunch, but it includes a number of other unique features. 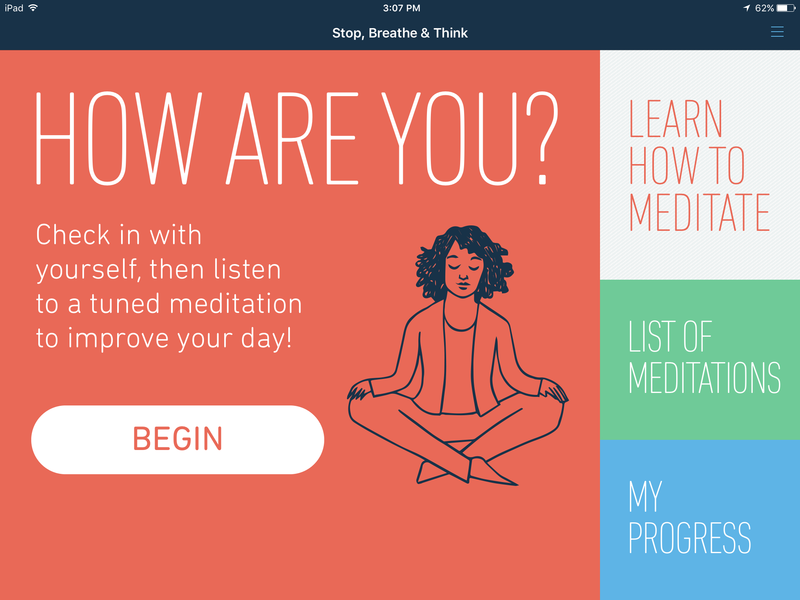 While the mediation counter and resulting badges are similar to what is found on “Stop, Breathe and Think,” Smiling Mind is the only app I’ve found with meditations specifically geared to different age levels (see the 2nd shot above). 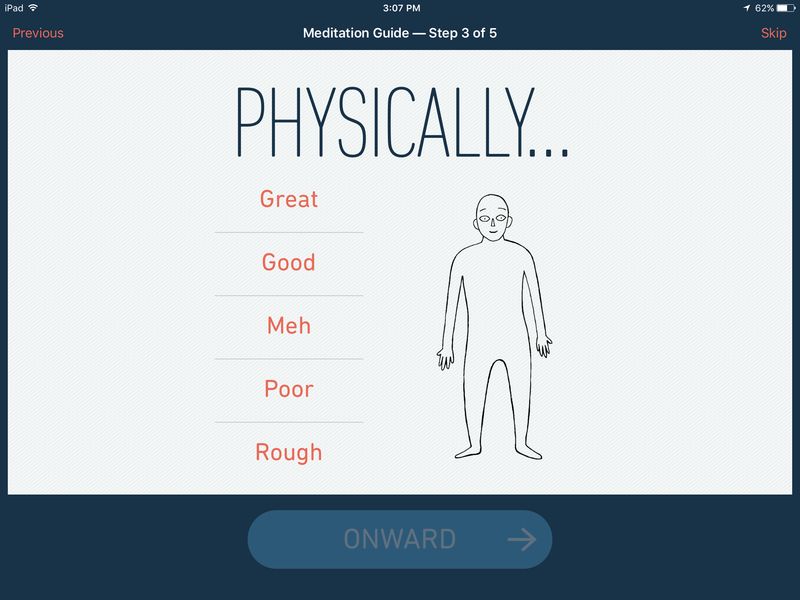 Within each older age group is a “course list” of downloadable, guided meditations designed to teach and encourage a meditative practice. 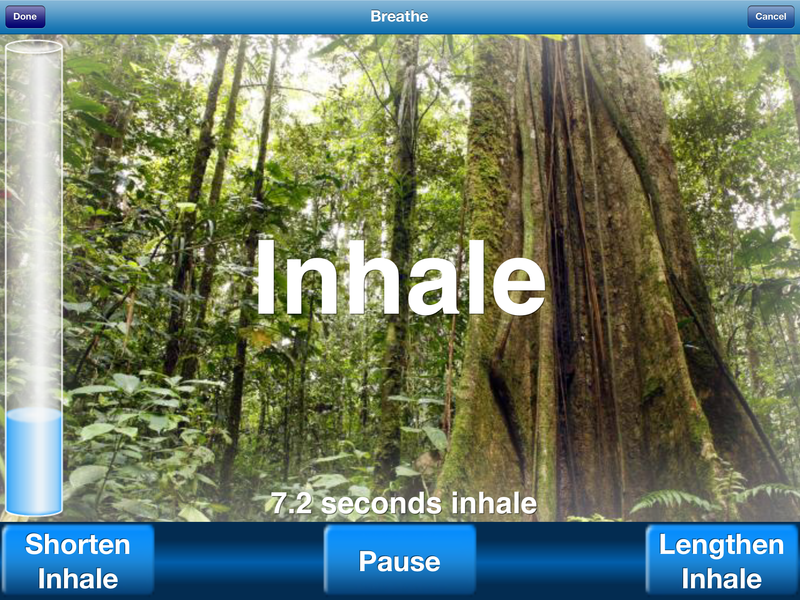 It also includes a “social media” function so your friends can observe and encourage your meditation. 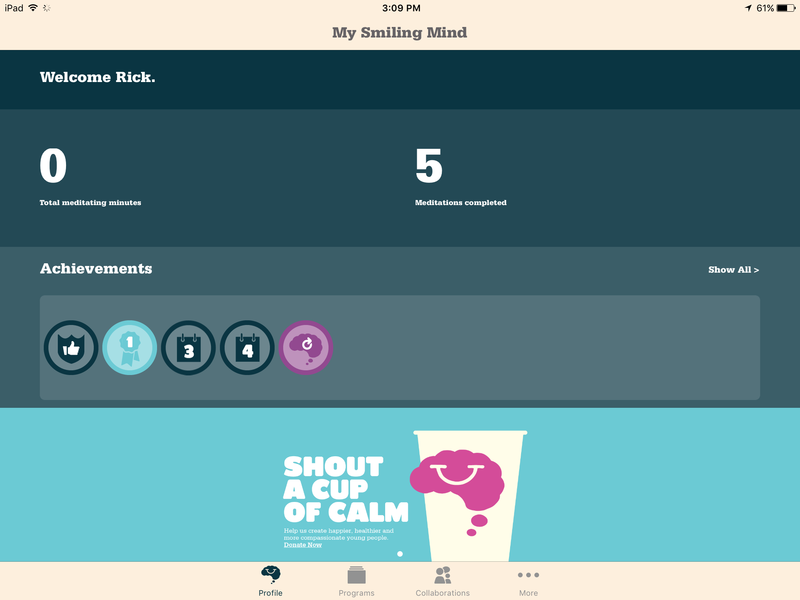 And the voices are Aussies, reminiscent of Andy Puddicombe, creator and founder of Headspace. This simple, yet elegant app does one thing well. 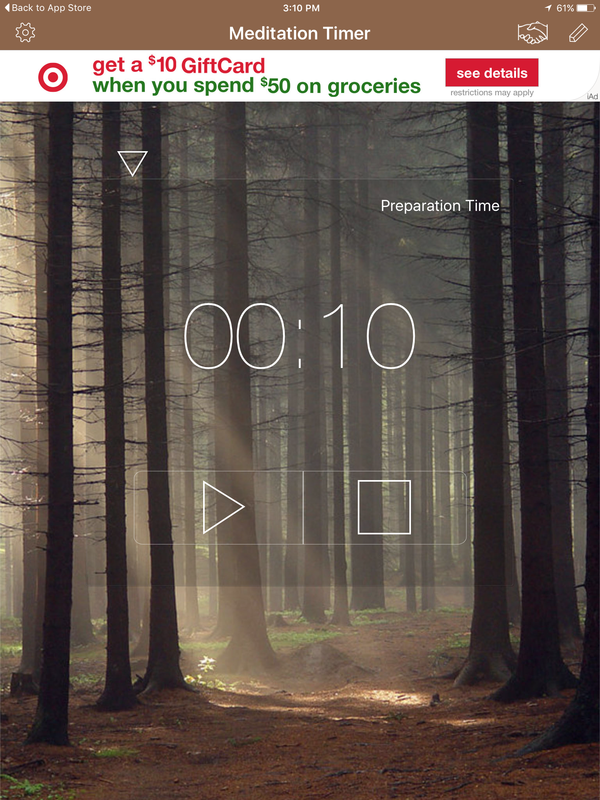 Although it doesn’t offer guided mediations or ambient sounds, it’s an excellent free timer. I use it every day to measure my 10 minutes of mindfulness. The free version is ad supported and has a couple fewer minor features than the inexpensive full version (which I purchased). I like how the user can set the time as well as sounds to mark intervals within the meditation. I use a deep chime sound for each 2:30 and then a specific bell at the end of the full 10 minutes. The app keeps track of my time and provides a number of key data points upon request. 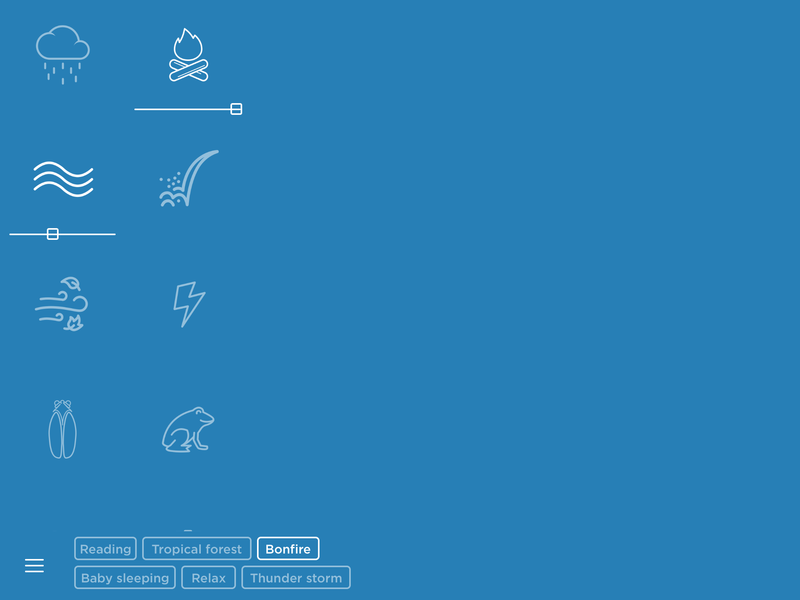 And I particularly like the option to easily post my meditation time on Twitter or facebook. 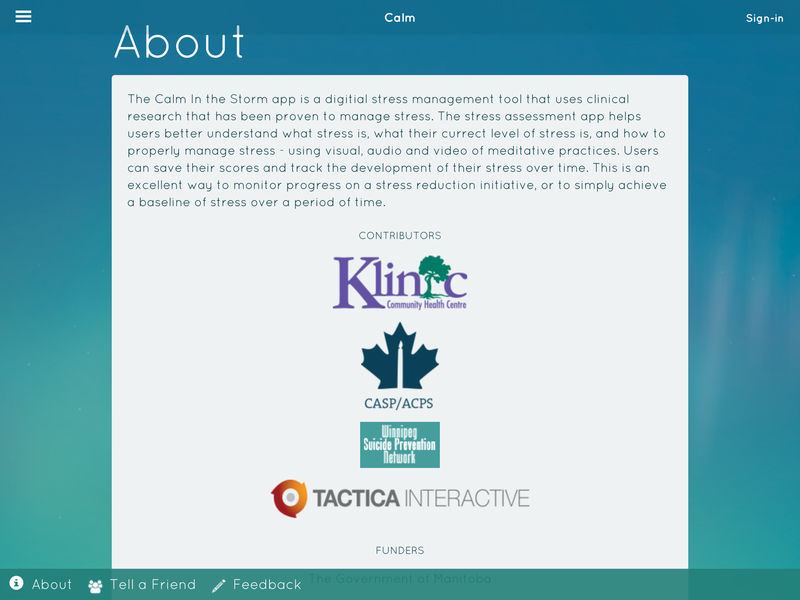 This app is also different then the others listed here as it is designed specifically for people who suffer from high levels of stress and/or anxiety disorders. 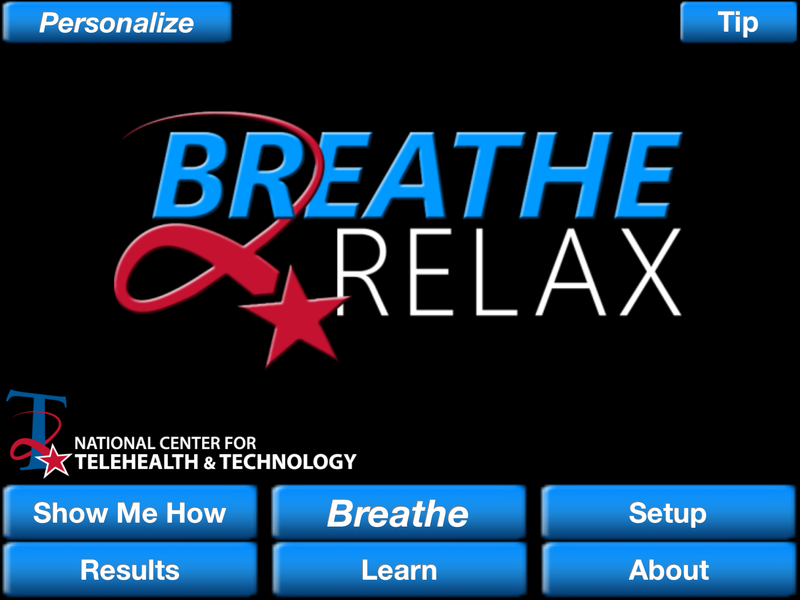 As you’ll see in the third shot above, there are guided meditations and relaxations within this app. These are set within the context of anxiety management and development of a plan to address anxiety and stress as they arise. 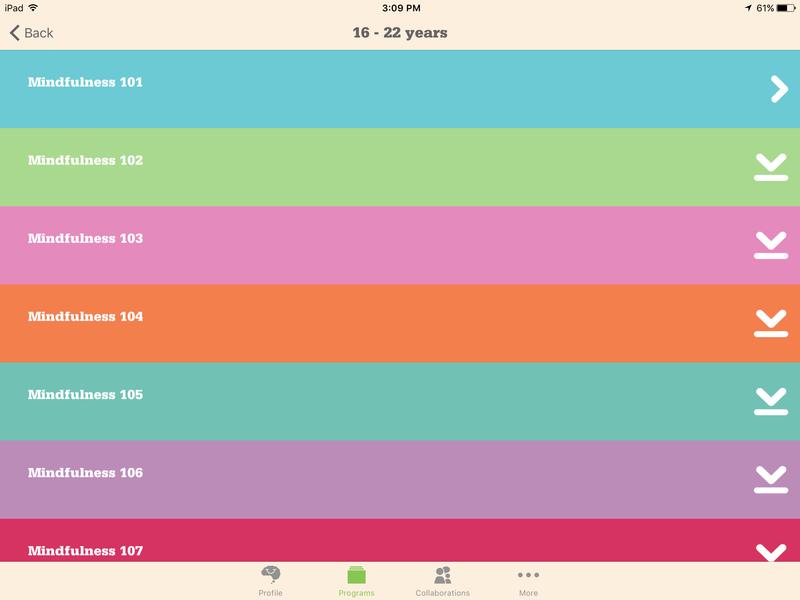 For some, this app may literally function as a life-saver. Do you have experience with any of these apps? 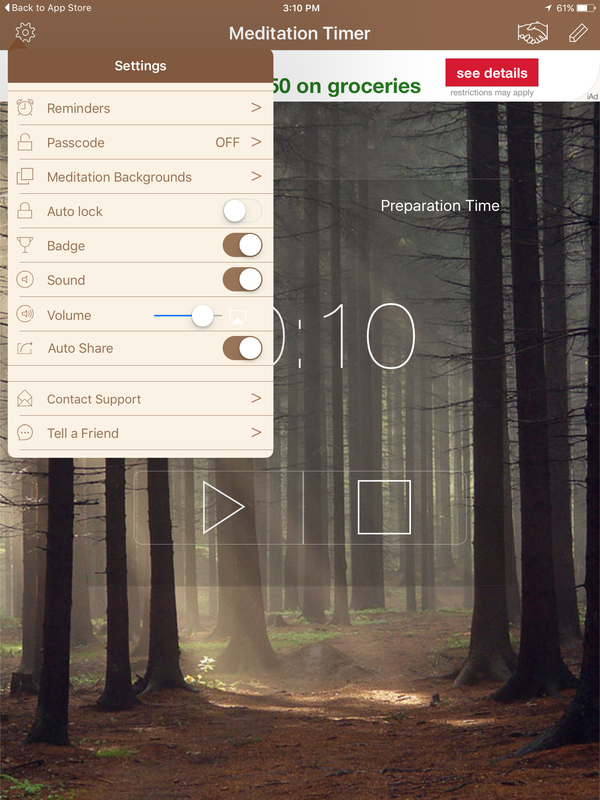 What additional apps have you used for ambient sounds and/or meditation? OK, it’s Sunday night (ugh!) And of course I worked much this weekend, but didn’t get as much grading, planning, etc done as I wanted to do. As I was getting ready to head downstairs to do my Sunday night task – folding laundry – and my every night task – washing dishes – I came across an encouraging article about the value of what I’m about to do. While washing the dishes one should only be washing the dishes. This means that while washing the dishes one should be completely aware of the fact that one is washing the dishes. At first glance, that might seem a little silly. Why put so much stress on a simple thing? But that’s precisely the point. The fact that I am standing there and washing is a wondrous reality. I’m being completely myself, following my breath, conscious of my presence, and conscious of my thoughts and actions. There’s no way I can be tossed around mindlessly like a bottle slapped here and there on the waves. 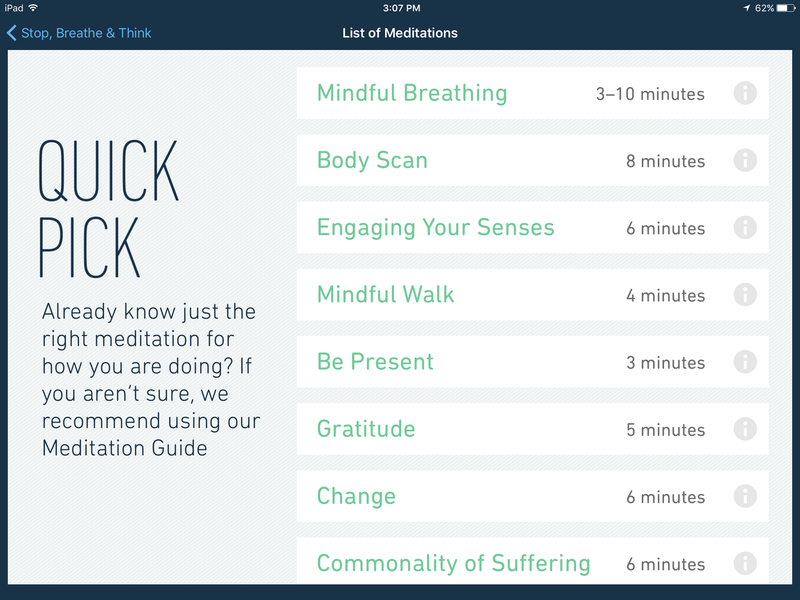 I’ve written on this blog previously about the many benefits of mindful meditation. And I have many more articles to share and reflections to offer on what I’ve discovered regarding the benefits of it. But, I can’t share these now — I have dishes to do and laundry to fold! As promised, here’s the big post with lots and lots of lists. I know that during this busy time of year, neither you nor I will be able to play around with more than a few of the resources accessed through these links. Heck, you might not even be able to do more now than just read this introduction! Please bookmark this post (and this blog in general) and return here again and again to explore a list or two. If I can discover one or two blockbuster (or even just pretty good) apps or sites (Kahoot is an awesome one that I discovered via a list) every month or so, than I feel like perusing lists a few minutes a week is time well spent! July’s “Best Lists” – There are 1,459 of Them! Special thanks to Educational Technology and Mobile Learning as many of these links were from that excellent site. Before posting a list of links to many ed tech tools, I share this post as a refresher on the instructional opportunities which are enhanced via the use of technology. Upside Learning offers a succinct presentation of “10 eLearning Trends for 2015,” along with compelling, supporting evidence. Clue 1: The teachers are resourceful and creative. They can turn anything into a tool for teaching. Clue 2: The school invests in effective delivery, not just quality content. Clue 3: Technology is purchased wisely and used efficiently. Clue 4: You see kids actually playing at school because the school understands that play is not a treat. Again, visit the article for descriptions of each point along with links to tools. My two favorite, which I don’t think I can figure out how to work into my Religion classroom are: #21: 3D printing and #26: Robotics in the classroom. I’ll be honest – I was a late-adopter for Twitter. I skipped MySpace. Got on board facebook (of course) and LinkedIn for my professional life. I’ve not jumped in to Instagram or some of the younger focused platforms. The more I use Twitter personally, the more I think about how it could be used in the classroom – at least at the high school level. Apparently, I’m not the only educator thinking along these lines. Here’s another, shorter list of educator tweets to follow. And another similar list. Lastly, an interesting look at how Twitter is central in political debates, particularly over the Common Core and the “opt-out” movement. iPads are the worst technology students will ever use. Wow. How true. And how often I am so enamored and amazed by what the iPad can do that I forget this simple fact. When today’s elementary students are 40, they’ll remember iPads the way (many of us) remember cassette tapes. It will be funny that they used to hold large, heavy glass rectangles in their hands, and had to open up apps separately. And had to know which app did what. And had to “Google” information. And sometimes weren’t even connected to the internet because WiFi signals were unreliable. My experience confirms this. When I was in elementary school I remember playing Oregon Trail (this version and not this revised one) on a green-screen Apple IIe. In the late 1980’s when I was in college I typed and printed my papers on an all-in-one word processor. People who are older than me remember before there were palm sized transistor radios. It’s hard to imagine how outdated iPads will seem in 5 or 10 years. While there’s no shortage of predictions about what the future of consumer technology will hold, we can’t ever predict it accurately. When I got my first Walkman in 1985 could I possibly believe that 20 years later I’d have an iPod which held a ridiculous amount of music? My takeaway from the inevitability of the rapid and unanticipated evolution of technology is two fold. First – Don’t get too wedded to any one particular form of hardware or software as ‘this too shall pass.” More importantly – I should teach my students how to learn about using technology rather than simply having them learn content via technology. Let me share an example from my freshman class this Spring. Recently I had my students pair up to create “social media” pages from the perspective of a character in Genesis. I had them use the Tackk platform for this assignment. Meanwhile, my colleague who teaches the other freshman Religion classes used Blendspace as the platform for a similar assignment. I’m planning to assign my students a similar project to create a “social media” page for a Judge, King or Prophet. Should I have them use Tackk again in order for them to develop their novice skills on that platform? Or is there more learning potential in having them use Blendspace, even if their output will be of a beginning level? Governed by the philosophy of teaching students how to learn about using technology, I think I’ll opt for the later and not former option. Sure, there will be more of a learning curve for me as well, but I think learning how to pick up a new technology and use it effectively is a 21st century skill equal to the other ones on the typical lists of these skills. As always, I’ll let you know how Blendspace works out for my students and me. 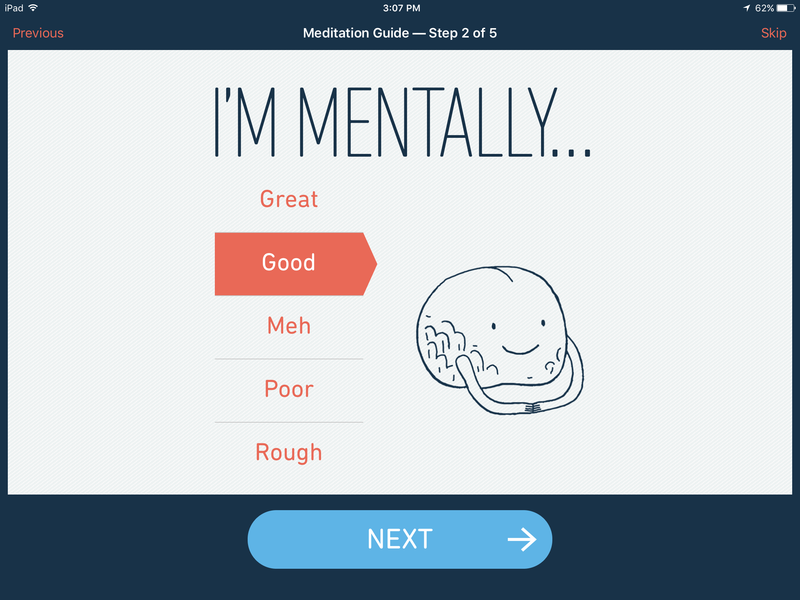 Recently I described how I used the Headspace app to help my students learn how to mindfully meditate at the start of each class period. 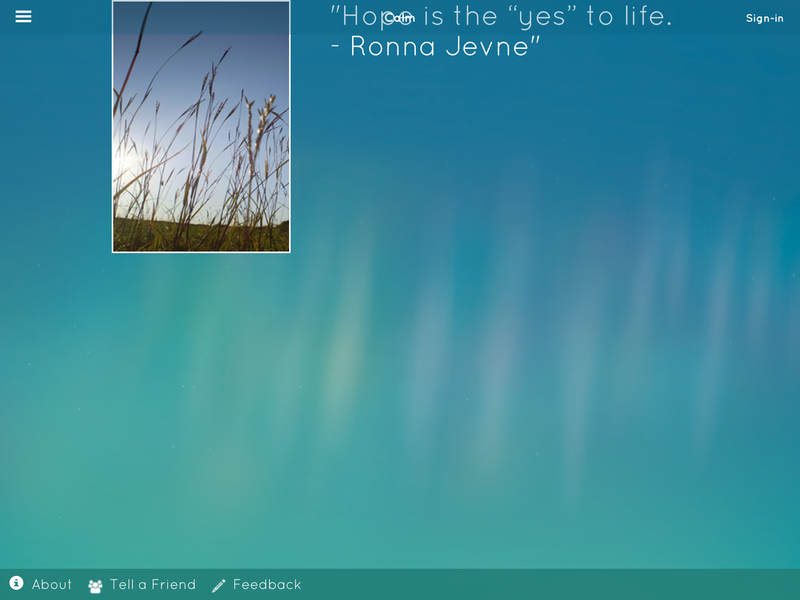 On my own, it took me a few more than ten days to complete the free trial of ten sessions. 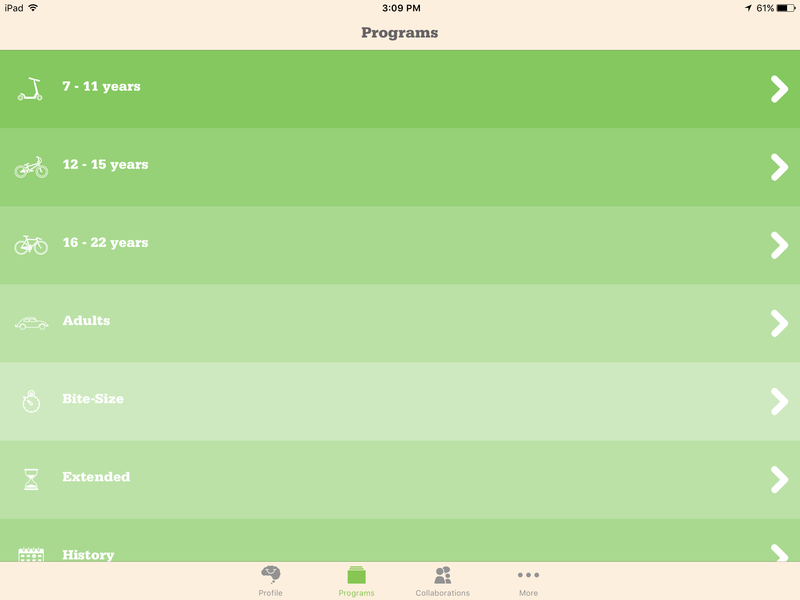 Although I am now meditating using a different app with nature sounds, I can highly recommend the Headspace trial. After signing up with an email address and password (or signing in with your facebook account), you can access the ten free sessions. Don’t worry, no credit card is required at this point. Click on session one and a cute, 1 1/2 minute animate will begin. If you want to jump right to the audio for the first session, close the video and proceed. 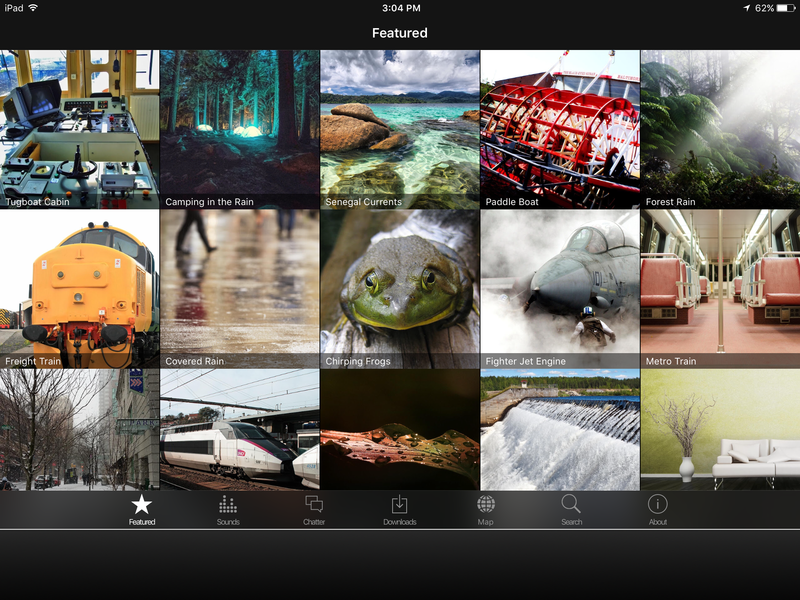 There is also a free iPad/iPhone app that you can download via the App Store. Search under “Headspace.” You won’t see it on the screen that comes so you need to change the search to “iPhone only” (upper left side). You’ll then see the app and have the ability to download it. After signing into it (with a username/password you’ve set up through the website), you can access the 10 free sessions. I think the post title says it all. Visit HERE for many, many STEM sites and resources.